Only a few episodes of this wartime series survive as recordings today, which is a tragedy as what we do have is uniformily excellent. The idea was for each episode to tell the story of a single warrior. One episode was about a British Spitfire pilot. Another was about a K-9 Corps soldier on a Pacific island. Still another was about a sailor on the cruiser U.S.S. Boise. Jackson Beck--one of old-time radio's most talented and distinctive voice artists--narrated the series, describing the action in the second person to add to the feeling of urgency inherent in each episode. "Company Aid Man" is about a guy who doesn't actually carry a gun--an army medic serving with a unit in the Italian campaign. We accompany him as he moves under fire to treat the wounded. In a rare (for wartime) scene that humanizes the Germans, he helps a wounded German as well, while several other nearby Germans opt not to fire on him. There are two extended action scenes within the half-hour story, linked by the medic's interaction with another soldier. Altogether, it makes for an intense, dramatic half-hour that is well-worth your time. 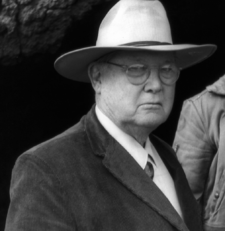 Erle Stanley Gardner (pictured here) is best remembered today for his excellent Perry Mason novels, but he was an incredibly prolific author during the days of the pulp magazines, publishing stories about dozens of different characters in dozens of different magazines. And he was good--a magnificent storyteller who was an expert in constructing intricate mystery and adventure plots. His Mason stuff probably is his best, but you can read just about anything he wrote and have a good time. In 1939, Gardner (using the pen name A. A. Fair) wrote the first of a series of novels about Bertha Cool and Donald Lam. Bertha is the owner of a detective agency. She's overweight, mildly profane, mildly unscrupulous and very, very stingy. She's also smart and tough as nails. Perhaps the smartest thing she did was hire disbarred lawyer Donald Lam as her primary investigator. Donald barely tops five feet in height--he doesn't seem to be very tough and, in fact, he gets beaten up an awful lot. But he never gives up and he never stops thinking. In fact, as Gardner tells us, he has "a brain that worked so fast that sometimes he couldn't keep up with it himself." Together, Bertha and Donald make a great pair of protagonists in a series of twenty-nine novels published between 1939 and 1970 (the year of Gardner's death). The second novel--Turn On the Heat--was published in 1940 and will act as our gateway into that decade. In this one, Bertha's agency is hired by a man who is obviously using an alias, but pays good money to track down a woman who went missing twenty years earlier. The client will not explain why. Donald investigates and soon discovers that at least two other people have also been looking for the long-lost woman. Before long, Donald is threatened and beaten up, but he keeps on asking questions. Soon, there's a murder thrown into the mix. Soon after that, dirty politics in a small town become a factor. Donald is framed on a hit-and-run charge by a corrupt cop and it looks like their client might be pegged for the murder. With Bertha's sometimes reluctant support, Donald makes plans and improvises when necessary as he stays one step ahead of everyone else, finally gathering up enough information to blow the lid off the case. It's a fast-moving plot which manages to bring all its seemingly disparate elements together coherently at the end. But it's the interplay between Bertha and Donald that really makes it fun. Both are great characters on their own. Together, they give the already fine plot a unique flavor that makes Turn On the Heat a great mystery novel. 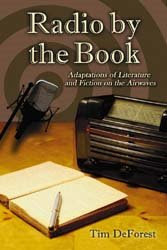 My copies of my new book--Radio by the Book: Adaptations of Literature and Fiction on the Airwaves--arrived at my doorstep yesterday. So I am published yet again. The book is admittedly a little expensive. If you're interested in reading it, but can't fit it in your own budget, ask your local library to acquire it. Then you can read it for free. The creation of Superman in 1938 opened up the floodgate for costumed superheroes within the relatively new medium of comic books. Within a couple of years, there were more superheroes buzzing around than you could shake a death ray at. Many of these masked marvels had--like the Last Son of Krypton--superpowers. Others, though, were just regular guys, who donned their own unique costumes and battled crime while trusting to their own natural abilities to see them through. The most famous of the non-powered superheroes has got to be Batman. 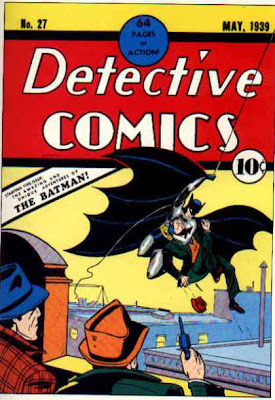 And it's Batman's first appearance--in Detective Comics #27 (1939)--that will round out our look at the 1930s. 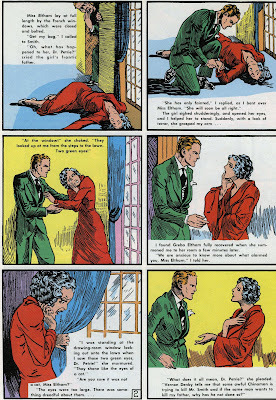 You really got quite a lot for your dime when you bought a comic book in 1939: sixty-four pages of adventure splashed on each page in bright primary colors. Batman's first adventure, titled "The Case of the Chemical Syndicate," takes up only six of those pages. 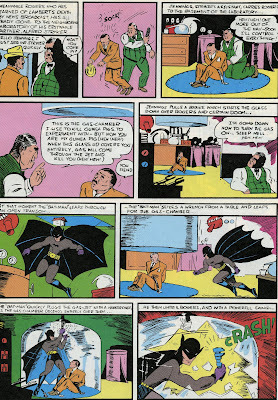 Written by Bill Finger and with art by Bob Kane, it's no surprise that the Dark Knight stood out from the crowd. Finger actually lifted the plot from a Shadow novel published a few years earlier (Partners in Peril), but his skillful storytelling and Kane's striking art more than make up for the minor literary theft. But though Batman might be the most important historical element of Detective #27, it's good to remember that there is a lot more cool stuff there as well. 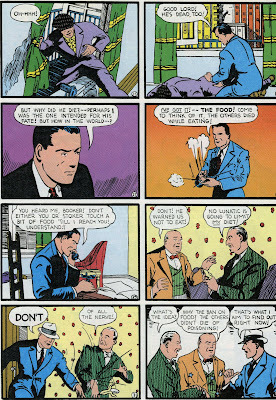 Two different stories produced by Jerry Siegal and Joe Schuster (Superman's creators) are included: "Slam Bradley" and "Spy" both feature standard hard-boiled heroes, but both tales make for fun reading. "The Crimson Avenger" balances out Batman as another costumed hero--mimicking the Shadow in both appearance and style. "Speed Saunders" is yet another fedora-wearing tough guy hero, while "Buck Marshall, Range Detective" catches crooks out West. There's a few short humor stories, a two-page prose story titled "Death on the Airwaves," and an adaptation of one of Sax Rohmer's Fu Manchu tales. All the stories maintain the detective theme, with the heroes following up clues or employing deductive reasoning to nail the bad guys. But throughout the issue, action is emphasized over plot. Still, the plots are, for the most part, pretty solid, weaving gun battles and death traps throughout simple but logical storylines. Batman may be the big commercial success story here, but Slam Bradley, the Crimson Avenger and their comrades-in-crimefighting don't do half bad themselves. It's a pity that the economics of the industry don't allow comic books like this anymore--where each issue gave us a nice variety of stories and characters linked by a common theme. While Cagney was blazing away with a tommy gun and the Shadow was matching wits with modern day pirates, Conan the Barbarian was busy defending his hard-won throne against assassins, wizards, carnivorous apes, giant snakes and vampires. Gee whiz, the 1930s really was a decade of slam-bang action. 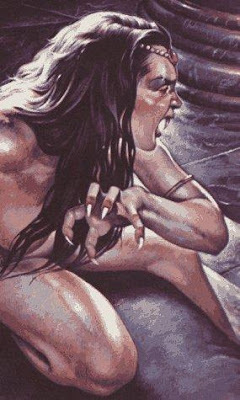 Conan was created by Robert E. Howard, who published the adventures of the blood-drenched barbarian in the pages of Weird Tales magazine. 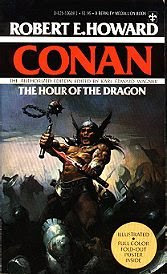 Howard wrote less than two dozen Conan short stories and novellas before his untimely death, recounting the character's varied lifetime in no particular chronological order. The stories jump back and forth throughout Conan's career as a thief, pirate, mercenary and (eventually) king. Hour of the Dragon, serialized in Weird Tales in 1935/36, is Howard's only novel-length Conan story and it is arguably the best of the lot. Picking up after Conan has become king of the powerful nation of Aquilonia, it involves a plot by a neighboring country to use a combination of military power and sorcery to overthrow the barbarian king. An ancient sorcerer named Xaltotun is resurrected to help, but soon proves too powerful himself to remain in a subordinate role. Conan, in the meantime, finds himself imprisoned in a dungeon, thought dead by the Aquilonians. 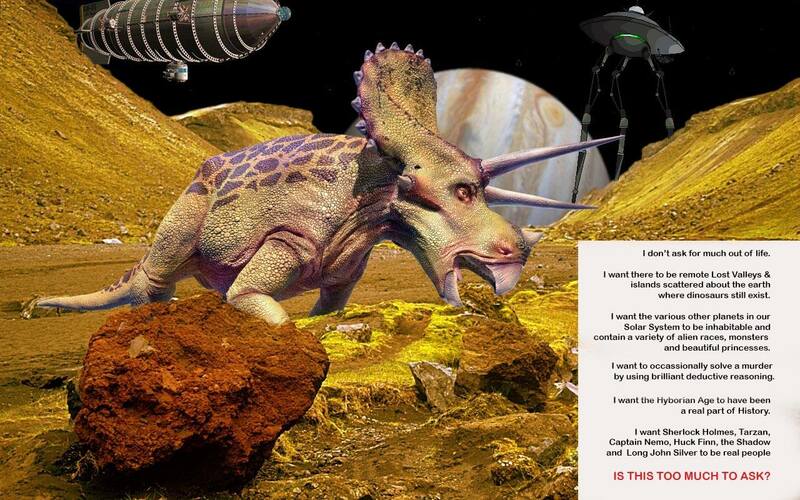 But he soon manages to escape, killing a giant carnivorous ape on his way to freedom. He learns about a magical talisman that can be used to defeat Xaltotun and begins a quest to recover it. This provides a platform for Howard to give us a series of truly exciting action set pieces--everything from single combat between two opponents to epic battles involving thousands of soldiers. There's also some truly creepy stuff that reminds us Howard could provide us with horror as well as action-adventure. At one point, Conan has traveled to the sorcery-soaked land of Stygia (a fantasy analog to ancient Egypt) and enters a pyramid in search of the talisman. His wanderings through the pitch-dark maze, encountering a vampire and several other horrific beings along the way, makes for a truly hair-raising read. The plot is not perfect--relying on unlikely coincidence several times to carry the story along. Also, Conan is aided in his escape by a harem girl who pretty much pops out of nowhere (having fallen in love-at-first-sight with Conan) to aid him. But the prose is so vivid, fast-moving and just plain fun that we can easily forgive these flaws. This all begs the question: Who would win a cage fight between James Cagney, the Shadow and Conan the Barbarian? Today we combine our regular Friday feature with the "Decade by Decade" series and take a look at an episode of The Shadow from June 12, 1938. I don't know how society would have survived past the 1930s without the help of heroes like the Shadow. It's apparent from listening to his radio series (and reading his pulp adventures) that madmen and villains of all sorts stalked the mean streets of New York (as well as just about everywhere else) and that horrible death was no farther away than the prick of a hypodermic needle, the click of the timer on a bomb, or the sudden lunge of a rapid dog. But, by golly, the Shadow was there to keep us all safe. In "Death from the Deep," he goes up against a wealthy madman who has built his own submarine. The modern day pirate wages war on merchant and passenger ships, but the Shadow manages to track him down, bringing matters to a head in a confrontation aboard the sub. Orson Welles was the Shadow in this one. It's always fun to listen to his performance knowing he was playing the part cold, without prior rehearsal and without having even glanced at the script before the live broadcast. (This was part of Welles' contract, making sure he had time to see to his Broadway responsibilities with the Mercury Theatre.) Welles could sight-read during the broadcast, jumping a little ahead of the lines he was currently speaking in order to guide his performance. It's amazing how good he was in the role using this method. The story itself is, like nearly every Shadow episode, pure melodrama. But it's entertaining melodrama, played straight with fast moving plots, good acting and good sound effects. Besides, the idea of a modern day pirate in a submarine is just plain cool. As we enter the 1930s, it soon becomes apparent that if you want the absolute best in slam-bang action and tough guys (any of whom could, without exception, beat the snot out of modern day leading men such as Tom Criuse or George Clooney without even working up a sweat), then you have to turn to Warner Brothers. The WB is responsible for the best gangster and crime films ever made. The studio played off the talents of Cagney, Bogie and E.G. Robinson, while drawing plot elements and story construction from the hard-boiled school of detective fiction, Warner Brothers gave us classic after classic during the 1930s. The Roaring Twenties, Bullets or Ballots, Little Caesar, Public Enemy, The Petrified Forest and other gangster films gave us wonderful stories and characters, filmed in beautiful black-and-white while dropping in more than their share of superbly designed action set pieces. 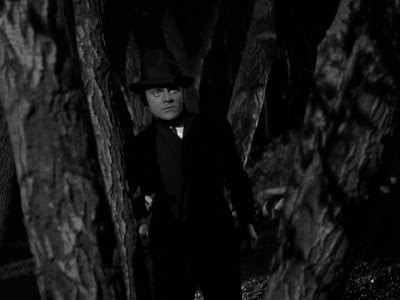 G-Men (1935) is a fun and interesting example of the genre because it takes Cagney's image as a tough guy and manages to believably plop him down on the side of the angels. Cagney is "Brick" Davis, a down-and-out lawyer who nonetheless remains honest and refuses to work for gangsters. When a friend who joined the Justice Department is killed, Brick opts to join up as well, hoping to get a chance to nail the thugs who committed the murder. The plot is a well-constructed police procedural, with Brick and the other G-Men using reasonably believable methods for tracking down the bad guys. Along the way, they engage the villains is a series of blazing gun battles. There are few more entertaining images in existence than those of Warner Brothers tough guys blasting away at each other with tommy guns, shotguns and .45 automatics. The director was William Keighley, one of a number of Warner house directors who had a spot-on sense of what looked good on film. A subplot involving Brick's adversarial relationship with his boss and his eventual romance with his boss's sister is handled well, getting us to like these characters all the more without interfering with the flow of the main plot. Cagney is backed up in the film by a number of talented character actors, including Robert Armstrong, Lloyd Nolan and Barton MacLane. That is, of course, another main strength of the WB gangster films. The old studio system (where actors were under contract to a specific studio and assigned to the films they appeared in) is open to a lot of legitimate criticism in terms of labor practices, but it did create a stable of skilled character actors that gave real backbone to the movies of that era. By golly, we’re going to stay with the honorable career of bloodthirsty piracy as we take a look at our chosen book for the 1920s. Rafael Sabatini’s best novels are more fun than a barrel full of pirate-monkeys. He wrote historical novels in a slightly-flowery prose that seems to fit his subject matter perfectly and formed passages that often beg to be read aloud. His dialogue is sharp and trenchant, often serving as much as the action set pieces to increase the level of tension and suspense within his plots. 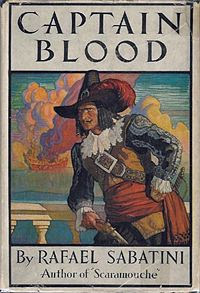 Sabatini was introduced to American readers in 1921 when Captain Blood (a pirate novel second perhaps only to Treasure Island for its pure entertainment value) was serialized in the pulp magazine Adventure. Peter Blood was a doctor, who (during his restless years as a young man) had wandered about 17th-Century Europe, fighting in wars and learning the craft of seamanship. When the novel opens, though, he’s settled down in the quiet English town of Bridgewater. But when he provides medical aid to a rebel, he is branded a traitor and shipped off to the West Indies as a slave. Once there, he eventually plans a mass escape (though not before taking the time to fall in love with Arabella Bishop, the beautiful niece of his owner). He and his fellow ex-slaves get hold of a ship and turn to piracy. Blood turns out to be really, really good at piracy. Much of the saga now turns to tracing his career as a buccaneer as he eventually builds a small fleet. He plans a raid against the Spanish city of Maracaybo. Trapped inside the harbor by the Spanish fleet, he uses several audacious strategies to fight his way free. Blood soon becomes involved in some complex political machinations, with various governments trying to recruit his services for various reasons. The story climaxes in a wonderfully described sea battle as Blood attacks two French ships in the harbor of Port Royale. By the time everything (including Blood’s romance with Arabella) is satisfactorily resolved, the reader finds himself jumping back to re-read the final battle because it’s just that good. Peter Blood may just possibly the best-sounding fictional name ever. Even so, the good doctor manages to live up to the promise of adventure inherent in the rhythm of his name. How he ever thought he could get away with living the quiet life of a country doctor is beyond me. With a name like Peter Blood, you’re pretty much stuck being a pirate. DECADE BY DECADE, Part 1: The First Swash Ever Buckled. This series will walk us from the 1920s through the 1970s, taking a look at one book, one comic book (meaning a specific issue rather than a series), one movie and one radio show from each decade. But in the 1920s, comic books featuring original stories weren’t yet around. (Early comic books reprinted newspaper strips; comic books with new stories weren’t regularly published until the mid-1930s.) Commercial radio was in its infancy, with little if any of what was produced in the 1920s surviving today. So for this first decade, we’ll discuss one movie and one book. Comics and radio will be added when we get to the 1930s. 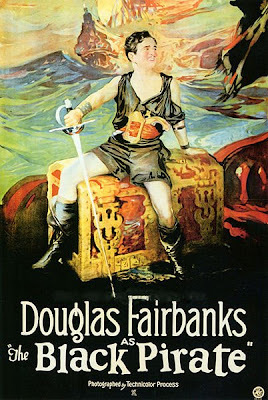 The Black Pirate (1926) starred Douglas Fairbanks, Sr.—the father of the swashbuckler. Few other actors, in fact, have buckled swashes with the same flair and style as Fairbanks. A skilled athlete and acrobat, he performed some amazing stunts over the course of his career in silent films. In The Black Pirate, Fairbanks plays a man who joins up with the pirates that had killed his father—secretly planning on destroying the band. Along the way, he also takes time to fall in love with the lovely damsel that the pirates have taken prisoner. The plot is perfectly serviceable in terms of story, but its main purpose is to set up the various action set-pieces that allow Fairbanks to be suitably heroic. Most notable is a sequence in which he captures a merchant ship single-handedly. At the movie’s climax, there’s an extraordinary scene in which a crew of seaman swim underneath the pirate ship in order to board it unexpectedly from the other side. An early color film, The Black Pirate remains an entertaining and visually striking film to this day. It’s an interesting bit of film history in that it introduced many of the elements that would become clichés of the genre. But it’s also an example of great storytelling; Fairbanks was perfectly at home within the silent film genre (his high-pitched voice pretty much ended his career with the advent of sound) and his wonderful stunts are as good as any you might see in a modern movie. Besides, all those old sailing ships appearing throughout the movie are just plain cool to look at.